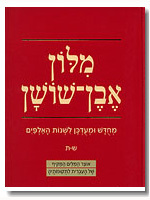 Edited by Abraham Even-Shoshan, Moshe Azar, and Kineret Zmora-Bitan. The standard Hebrew Language Dictionary, now revised and updated. This is the six volume unabridged edtion, a concise one volume edition is also available.